Grand Champion Hillsboro Graphic '14 with professional whipper-in Leilani Hrisko. 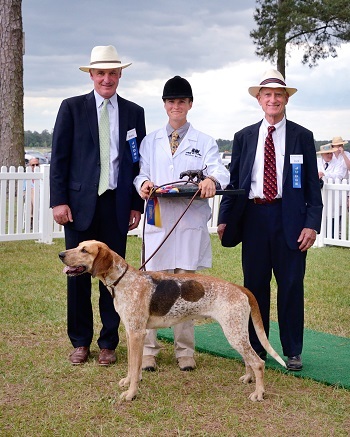 Judges (l-r) are MFHs Tony Leahy and Dr. Jack Van Nagell / David Traxler photoHillsboro Graphic '14 was judged Grand Champion of Show at the thirty-ninth annual Carolinas Hound Show held at the Springdale Race Course in Camden, South Carolina on May 8 and 9, 2015. Whelped to royal bloodlines—American on the sire’s side and English on the dam’s side—it should have been no surprise to see Graphic garner top honors. Her sire is Hillsboro Jethro '08, son of the magnificent Potomac Jefferson '05, Grand Champion Foxhound at Virginia in the year of the MFHA Centennial celebration, 2007. On the dam’s side, Graphic goes back in tail female to North Cotswold Grapefruit '95, a Peterborough Champion and dam of several influential foxhounds in North America including Iroquois Grundy '98, Master Jerry Miller’s all-time favorite foxhound, and Mid-Devon Grocer '00, sire of Virginia and Bryn Mawr champion hounds from Blue Ridge. Foxhounds from fourteen hunts and five states trod the flags at Carolinas: Aiken, Camden, DeLa Brooke, Green Creek, Hillsboro, Keswick, Lowcountry, Moore County, Red Mountain, Sedgefield, Tennessee Valley, Tryon, Whiskey Road, and Why Worry. Last year, while hunting with the Red Rock Hounds (NV), I met Renee and Kail Mantle from Big Sky Hounds in Three Forks, Montana. Kail gave us a bucking horse lesson one day before hunting. This Montana cowboy, who hunts in chaps and cowboy hat, had sat calmly to his horse bucking crazily above the sagebrush and had seriously impressed me. When a group of these Western foxhunters invited me to accompany them to Ireland this year, I jumped at the chance. These were fun people---more than a little crazy, and I wondered if anyone had warned the Irish! I also wondered if my companions knew what they were getting into. I had hunted the big Irish walls and hedges in 2000, and I came home with newfound respect for anyone who hunts regularly in Ireland. 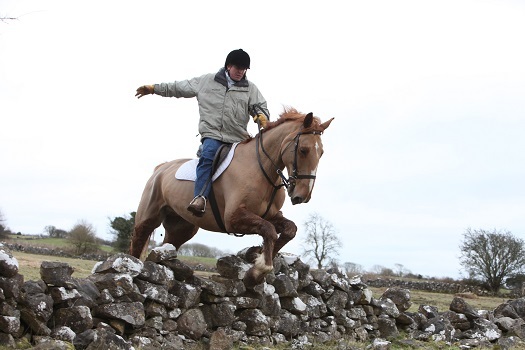 It is challenging country, and their version of foxhunting is an excuse to run and jump really big fences. Virginia Foxhound Show, Oatlands, 1986: Huntsman Shelly O'Higgins receives trophy from Joan Jones (now President, Virginia Foxhound Club). Judges are (l-r) Captain R.E. Wallace, MFH, Exmoor Foxhounds (UK); Bun Sharp, MB, Nantucket-Treweryn Beagles; Sherman Haight, MFH, Mr. Haight's Litchfield County Hounds. The venerable Virginia Foxhound Club—the team that brings you the Virginia Foxhound Show each year—is celebrating its sixtieth anniversary. 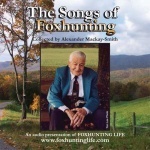 It seems timely to look back, evaluate the importance of hound shows in the overall scheme of foxhunting, and convince those with a passion for the sport that their membership in the Virginia Foxhound Club, no matter where in North America they hunt the fox or the coyote, is an investment that will benefit all fox hunters and their hunts. The Virginia Foxhound Show, the largest hound show in the world, brings foxhounds of all types and all strains to the flags for viewing, comparing, and judging. Whether a Master or huntsman is seeking certain bloodlines, or an outcross to introduce hybrid vigor to the gene pool within his kennels, he sees such hounds at Virginia. And he has the opportunity to socialize and chat, in a magnificent setting, about the merits and traits of the canine objects of his desire. With your support, the best matings may continue to be made in Heaven, but they’ll be arranged in Virginia! Huntsman Jordan Hicks moves from the Tryon Hounds to the Piedmont Fox Hounds / Erik Olsen photoAs we approach the close of the 2014/2015 foxhunting season, here’s our report on thirteen hunts that have either hired or will require a new huntsman for next season. We have already featured personal close-ups of three of the migrating huntsmen—Guy Allman, Brian Kiely, and Graham Buston—and we plan to bring you more. We invite readers to fill us in on any moves that we’ve missed. We also invite you to send us a personal profile on any of these huntsmen that we can publish as a feature article. Or, just send us the information, and we’ll write the story. Use the “Contact Us” link that appears at the bottom of every screen to communicate directly with me, and be sure to include your phone number. What follows is foxhunting’s version of musical chairs. Julie Stuart Seger photoStuart Grod—popular field member of the Fairfield County Hounds (CT)—has retired after forty-three consecutive seasons hunting in the first flight. A retirement party was held in Stu’s honor at the hunt’s clubhouse on November 22, 2014, where well-known food and travel author Michael Stern read a poem he composed for the occasion. "Build a bridge with your hands on the mane;"
"Trot smooth as you head for the jump;"
"Go light when your hands hold the reins;"
"And don't crowd on the lead horse's rump:"
Since I started to ride with you folks. With your bright eyes, your wisdom, and jokes.